Preseason practice has been somewhat of an odd situation for LSU leftfielder Daniel Cabrera. Cabrera rebounded from a slow start to earn Freshman All-America honors. Cabrera finished the season with a .315 batting average to go along with eight home runs and 54 run batted in. The last Tigers freshman to put together such numbers was Mike Fontenot in 2000. When teammate Antoine Duplantis suffered a shoulder injury at the beginning of practice for Team USA last summer, Cabrera was selected by coach Paul Mainieri to be the replacement. Cabrera was the cleanup batter in Team USA’s lineup. However, most of the attention before Friday’s season opener against Louisiana-Monroe has been focused in other directions. People are talking about the three players who opted to return to school – Duplantis, outfielder Zach Watson and pitcher Zack Hess. 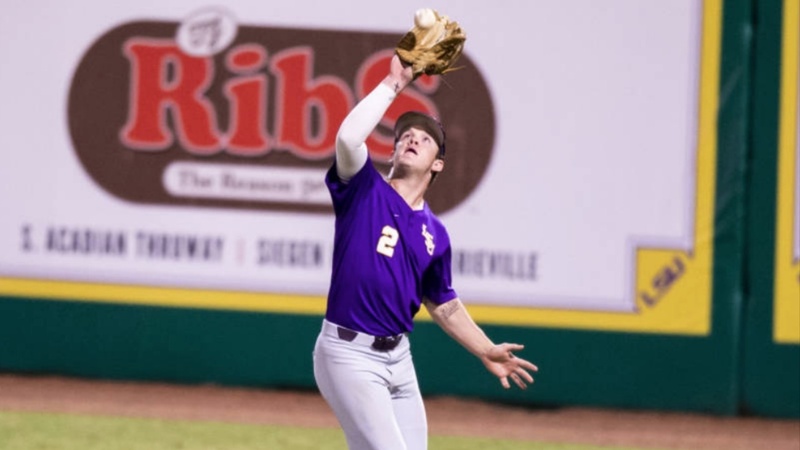 Other LSU fans have conversations about the two players returning from injuries – shortstop Josh Smith and pitcher Eric Walker. There is a third group of individuals who are excited about a handful of freshman pitchers – led by Landon Marceaux. Cabrera does not mind that he is not in the spotlight heading into the 2019 campaign. Only Duplantis had a higher batting average than Cabrera last season. He shared the team lead in home runs with Beau Jordan and Jake Slaughter. Cabrera was the team-leader in RBIs, slugging percentage (.525) and on-base percentage (.405). Cabrera feels that he is a better player than he was last year. Mainieri wants Cabrera to be a big factor batting fourth in the order – a spot he held last summer. On Team USA, Cabrera hit between Oregon State catcher Adley Rutschman, the College World Series Most Valuable Player, and California first baseman Andrew Vaughn, the Golden Spikes Award winner. Cabrera admitted that the Team USA experience really helped him last summer. Few questions must be answered as regards the Tigers’ everyday lineup. Watson and Duplantis will again be the centerfielder and the rightfielder, respectively. Watson and Duplantis were in the lineup when the Tigers reached Omaha in 2017. Freshman Giovanni DiGiacomo is the fourth outfielder. Smith, who played just six games last season because of a back injury, is 100 percent healthy. He will be the starting shortstop, his normal position. Brandt Broussard returns for a second season at second base. Hal Hughes, who replaced Smith at shortstop in 2018, is the starting third baseman. Drew Bianco and Gavin Dugas are the backup infielders. Bianco is best suited for the left side of the infield, while Dugas is being groomed as Broussard’s replacement at second base. Bianco is in a three-way competition with freshmen CJ Willis and Cade Beloso for the first base job. Mainieri’s biggest concern entering practice last fall was the catcher’s position. Hunter Feduccia was a disappointment last year when he batted only .233. He was also charged with seven passed balls. Two junior college catchers, both of whom are sophomores, are now on the roster – Saul Garza and Brock Mathis. Garza was expected to be the starter, but he suffered a knee injury during the fall. Garza, who had surgery, will not be able to catch until March. He will be the designated hitter to start the year. So, all of the catching duties will fall on Mathis until Garza returns early in the Southeastern Conference schedule. Here are the position players on LSU’s 2019 baseball roster.